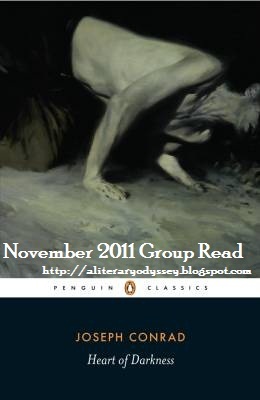 While the first posts for the October Group Reads still haven't gone up yet, I had great response. It seems as if the idea of posting once for a book during the broad span of a week was more appealing than multiple posts per book on a specific day. Maybe I am being premature in launching the next set of sign-ups, but I am going ahead with them anyway. :) Like I have said countless times before, I really enjoy the community aspect of reading a book "together." It also helps me get through some books that I would otherwise shy away from. I have read Conrad's "masterpiece" three times now. The first time I picked it for a read off the AP English list as a high school senior. The second two times were for college courses. I had a really hard time with this book each time I've read it. I don't know if had to do with experience, reading tastes, or something else, but I always came away feeling like I was missing something. It has been a number of years (5?) since I have read it, so perhaps my feelings towards it have changed. I know that it is one of the titles on my list I have been avoiding and I am hoping that someone, somewhere, will want to read it with me. "A masterpiece of twentieth-century writing, Heart of Darkness (1902) exposes the tenuous fabric that holds "civilization" together and the brutal horror at the center of European colonialism. Conrad's crowning achievement recounts Marlow's physical and psychological journey deep into the heart of the Belgian Congo in search of the mysterious trader Kurtz." If I haven't scared you off, here is what you need to do to join in on the fun! First, you need to comment here saying that you want in on the fun. Second, you need to read the book and write a post. Then, during the week of November 20-26, you need to link your post back to the master post here. Visit other participants and comment away. Easy enough, right? It would also be wonderful if you spread the word so we can have more participants! One of my goals for the fall was to read The Divine Comedy, and since I am reading the Inferno during this month, it is only right to carry on right into the second of the trilogy-Purgatorio. I know less about this one than the first, since it seems everyone generally reads the first and skips the other two! "As Dante ascends the Mount of Purgatory toward the Earthly Paradise and his beloved Beatrice, through "that second kingdom in which the human soul is cleansed of sin," all the passion and suffering, poetry and philosophy are rendered with the immediacy of a poet of our own age." 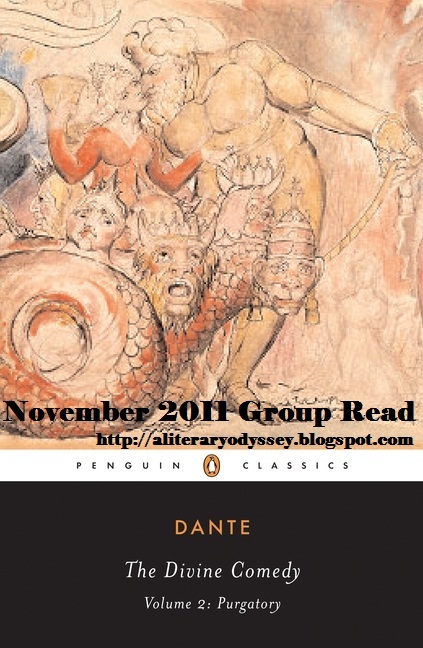 I know I am excited to carry on in my journey with Dante, and I hope that many of you will join in, even if you aren't participating in our current read of Inferno. To join in, you need to comment below to let me know. Then, read the book and formulate your thoughts into a post. During the week of November 20-26, come back here and link your post on my master post. Then you can visit other blogs, comment, and discuss throughout the week as more participants link up! I hope you all consider joining in on the fun! 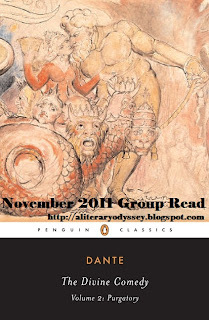 I know that in December I will be read the final book of The Divine Comedy as one of the Group Reads. I think I will put up a poll in another couple of weeks to vote on the second book for that month. Be on a lookout for it! Hmm. Not sure if I'll join in for either of the November reads. I already have a couple commitments/plans, and I seem to be excelling at over-committing lately. I'll see how the rest of October (especially 24hour readathon!) goes first. I read Purgatorio last summer though, so hopefully I'll at least be good for some comments! I will try to join you for Purgatorio, though with NaNo next month I never know how much time I'll have to read. Still, I've wanted to get to Purgatorio for a very long time, so I should! Heart of Darkness has been one of my favorites since reading it as a senior in my AP class! I've never read Heart of Darkness, but I've had a copy for months. Joseph Conrad is rumored to be a racist so he kind of scares me, but count me in for the HoD readalong! I wish I had time to partake in either of these series. I have read excepts from both of these books but not the whole thing. Count me in! I remember reading one of the books but can't remember which one. I'll join Heart of Darkness - any schedule yet?